POSTCARD #154: Delhi: For a few days now my bag has been lying on the bed while I search around for the clothes I’m taking with me on the trip to Thailand. The lid is hinged back, wide open like the beak of a baby bird in the nest. 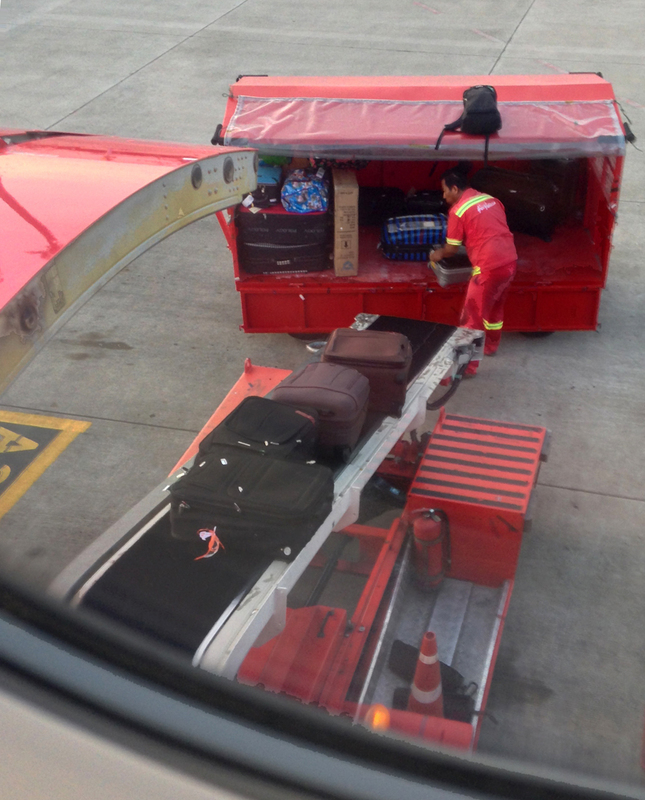 When the bag is filled to capacity (cases are always filled to capacity) it’ll close its mouth turn over on to its upright position and be wheeled away to the car, off to the airport, the check-in desk and into the cargo of the plane… a capacity inside a capacity. At this time though, the case is still unpacked and maybe I should not leave the cover of it open like this in case there are small creatures in the air that decide to fly into the bag and come with me to Thailand – like the time we were living in Switzerland and Jiab came back from a long trip to South America and the last stop was Peru. From Jorge Chávez Airport in Lima, she had three connecting flights, many delays and more than 24 hours travelling before she was back in Switzerland in the evening. Totally exhausted, she opened her in-flight bag to take a few things out and went to sleep immediately. I didn’t move the bag, left there lying open and went to sleep too – if I had closed the bag, then the stowaway wouldn’t have escaped into the room, or when it did, there’s a chance we’d have seen it…. In the morning I woke up to this blat-blat-blat sound coming from the mezzanine upstairs, so I went up to have a look. Step by step and cautiously, there was a table light that had been on all night. Something was inside the shade – a very strange winged insect banging itself against the light bulb. When it stopped and lay resting on the inside of the shade I could see it was a hard shelled beetle-like creature that folded its wings up inside its shell… hmmm this thing didn’t come from Europe, I’d seen something like it in India. I went down to the kitchen and found an empty glass jar with a screw lid and came back upstairs; it was flying at the light bulb again, blat-blat-blat. When it stopped for a rest, I manouvered it into the jar, got the lid on and took it downstairs. A kind of greenish square-shaped thing with a pointy end, about three quarters of an inch in size and sort of flat, like a spade. I tried to get Jiab to wake up to look at it, but she was not interested in that, totally asleep and it wasn’t easy. A very bleary-eyed, jetlagged look at what I held up in the jar for her to see brought only puzzled silence. After some consideration she said: Insects should not be in the house, and collapsed back on the pillow. So that was it, much later we discussed how it could have got here and decided it must have come in through an open window on her last day in the hotel in Lima and landed on the contents of the open bag. She closed the lid on it unknowingly, went to the airport and thus it stowed away on the flight to Europe. I studied the insect in the jar for a while then took it to the balcony, unscrewed the lid and gave it its freedom in the warm spring air. Watched it fly off down to the bushes and grass below. Who knows? Maybe it found distant members of a species once related, twice removed, reproduced and now there’s a hybrid genus developing in that part of Europe waiting to be discovered. Maybe encouraging stowaways isn’t always a good idea. The spiders don’t really eat flesh. Their venom rots it away. We’ve got the brown recluse in Australia (it came as a stowaway). We call it the fiddleback. Some sheds on my family’s property near Kempsey are infested with them. I don’t think there’s ever been a confirmed case of one biting someone in this country though. OTOH, the native redbacks and Sydney funnel webs bite a couple of thousand people every year, though redback bites have declined a lot as outdoor toilets have become less common. We tend to take it all in good humour. How did they treat your urchin wounds? Did they use the old ‘pound the bejeezus out of the injury until the spines break up and can be removed with needle and tweezers’ method? You are a marvelous storyteller 🙂 I was waiting and waiting for the insect to come out of the suitecase.. great build up and who knows what will happen to it..
All the best to it and to you!